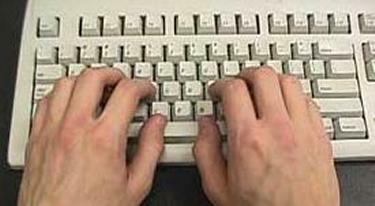 Starting with your left hand, place your little finger on key A, ring finger on S, middle finger on D and index finger on F. Your thumb must rest on the Space bar. With your right hand, place your index finger on J, middle finger on K, ring finger on L and your little finger on the next key. Press Enter with the little finger of your right hand. Always put your fingers back on the home keys after pressing any key. A picture of the key positions will be available during the lessons. It is important not to look at your own keyboard while typing. Look at the keyboard shown on the screen. Click the "Start Button" below if you are ready to begin the first lesson.